I’ve seen recipes for homemade baking mixes but never made any. Today I took the leap and made homemade baking mix with white whole wheat flour instead of all purpose flour. 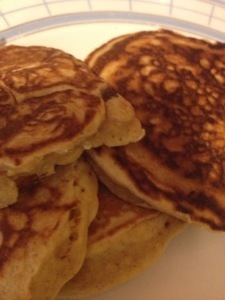 Then I used the homemade baking mix for pancakes. The Imaginative One aka the hollow leg ate 4 of the pancakes for breakfast. I guess they were a hit. The reason I’m posting this recipe is it can be used as a homemade gift. You can put 2 cups of the mix in a container and then include directions on what to add to the mix in order for them to make their own pancakes. Get a big bowl out. Place all of the dry ingredients in the bowl. Using 2 forks, pastry blender, or food processor, mix the shortening into the dry ingredients. Keep mixing until there is no visible shortening left. Don’t forget the flour at the bottom of the bowl. Place in a container with an air tight lid and keep in a dry cool place. Place ingredients in a bowl. Poke the yolks so you can stir better. Drop 1/4 c. of batter in a skillet or griddle that has been warmed up and sprayed with cooking spray. Cook until bubbles begin to appear. Flip to the other side. Continue cooking for 1 or 2 minutes.